At Aveda, The Art and Science of Pure Flower and Plant Essences, we believe that Nature is the best beauty artist of all. This is why we continually strive to increase our use of naturally derived ingredients whenever possible in our Aveda Products. Our commitment to deliver high performance, botanically-based products that are kinder to the planet – which is good for all of us — goes much deeper than our use of naturally derived ingredients in our products. 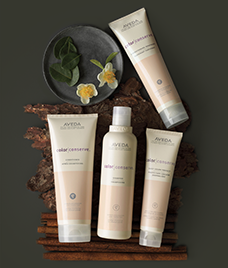 Learn more about Aveda and green ingredients and watch videos here. Aveda develops close working partnerships with certain communities and/or suppliers and seeks to use them as our primary source for specific ingredients in our Aveda Products. We frequently reference these relationships in our promotional materials. However, sometimes due to conditions beyond our control (e.g., drought, pests, and capacity limitations) these communities and/or suppliers are unable to meet our needs for an ingredient, including being unable to supply some or all of it. When such situations occur, Aveda uses additional suppliers to provide high-quality alternative sources until we are able to resume sourcing from the primary supplier. Helps preserve hair color for up to 6 weeks. Our 93% naturally derived leave-in treatment triple-protects your hair color with our powerfully effective, botanically-based color conserve complex™. Larch tree helps seal in color. help protect color from UVA/UVB damage. energizes with tourmaline to leave skin radiant and refined. Dry Remedy uses buriti oil, which comes from the fruit of the buriti palm tree , which is known as the Tree of Life. The palm grows along rivers in Brazil and local people gather the fruit as it floats near the shore. Buriti oil is extremely moisturizing, so its ideal for reviving dry hair in dry remedy™ moisturizing shampoo, conditioner, masque and daily moisturizing oil. and defines curl up to 57%. One of 7 groundbreaking products to be Cradle to Cradle Certified™ Gold. Our pure, gentle daily shampoo—with Morikue protein—cleanses and fortifies any type of hair. Infusing it with one of Aveda’s original aromas: a calming mix of 25 pure flower and plant essences. Discover soothing care to relax and refresh the senses. to fine hair—without stripping, build-up or static electricity. 4 Weeks to clearer skin. Outer Peace™ acne relief skin care.